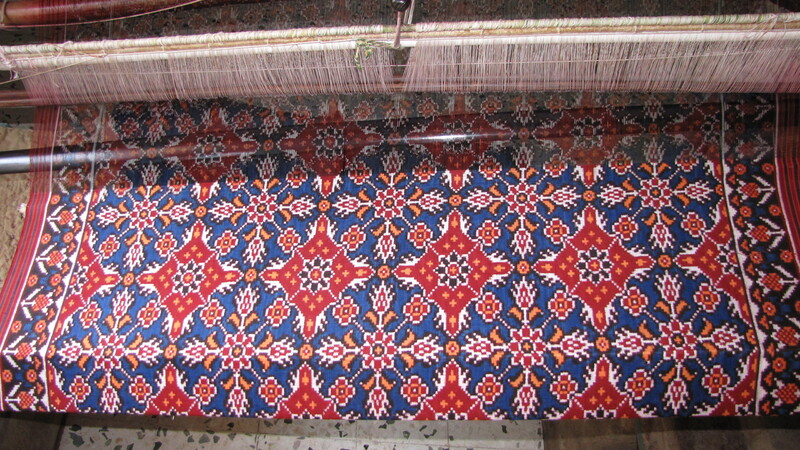 Patan in Gujarat is famous for the tradition of weaving patola, or double ikat since the 12th century. The process of tie-dyeing both warp and weft threads with such a fine pattern, and weaving so as to align these patterns in both sets of threads requires enormous skill and care. Patola are now only produced by the Salvi family. Each sari length takes 3-4 months to weave, and buyers must order far in advance directly from the family. This entry was posted in other regions of India and tagged Asian, Gujarat, ikat, India, patola, Textile, tie-dye, traditional, weaving by Wendy Garrity. Bookmark the permalink.